That would be ridiculous… he warms you up and guides you along his path, feeding you information and building comfort and trust until he closes you. You’ve been warmed up, and now when you click over to the sales page, you have a significantly higher chance of buying what we’re selling. 1 Landing pages are essential when it comes to effectively marketing your product online. Landing pages are essential when it comes to effectively marketing your product online. With internet marketing becoming increasingly more difficult with every passing day, making sales is troublesome. Even getting the chance to make a sale is a grace because it means you were actually able to get ranked well enough on Google to attract a customer. Landing page services have taken the internet by storm with the ability to spin up a new landing page that is SEO friendly and has a high conversion rate in just a few minutes. Gone are the days of hand coding these pages and hosting them yourself. Now, though using these tools may seem easy, without a conversion optimization expertise this will all be wasted money and time. and pick a winner at the end of the article. Enjoy! Pros: Cheap, easy to use, built-in autoresponder and split testing. Cons: Tech support is weak, and not the best design templates. 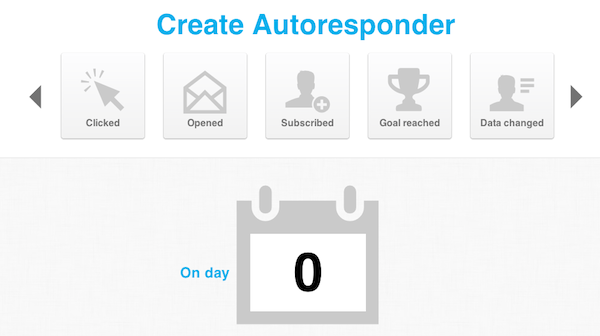 What I love about GetResponse is its combination of its use as an autoresponder and landing page creation software. While focusing on the integration of those two features, they also bring in nice split testing functionality and even allow you to submit surveys to your email list. Test your emails, landing pages, and web forms all through one service. Another awesome feature is the way you can automate a lot of the emails you send out. You can set emails to go out for certain goals such as you reaching 1,000 subscribers to your list or the one-year anniversary of your list. You can also set it so it sends out an immediate autoresponder email right after they subscribe – this is a great way to warm up a new lead. After these emails are sent out, you can observe the reports of their bounce, unsubscribe rate, and other important email marketing metrics. GetResponse lets you know everything that is happening with your list with very detailed reports so you can make the right decisions for your subscribers. The great thing about the landing page creation is that you don’t even have to buy hosting or a domain name. Unlimited domain names and free hosting are included. For a price of $15 per month, you can grow your email list out to 1,000 subscribers and have unlimited access to your landing pages. GetResponse is the service for new and experienced marketers alike to be able to have their auto-responder and landing page creation all in one place. Pros: Easiest service to use, tons of design templates to choose from, and the most popular service on the market. Cons: Price per month is steep, limited features on the lowest plan, email list integration isn’t built-in like GetResponse (but available for an additional fee). 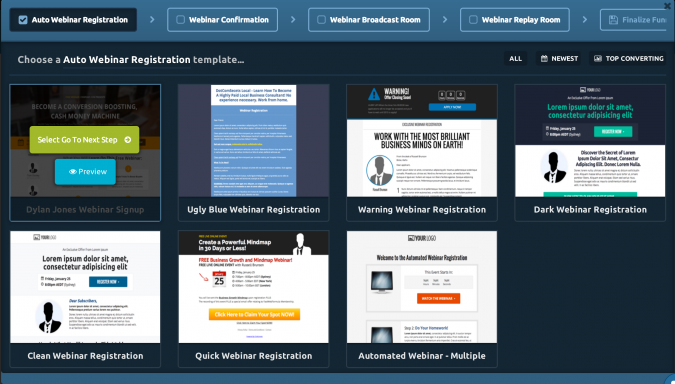 LeadPages is the company every marketer has probably heard of. 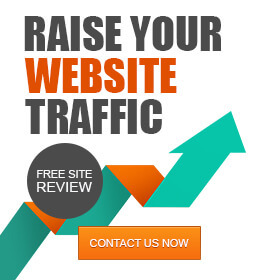 Everyone praises them as the go-to landing page provider, which in some cases I would agree with. Their aesthetically pleasing landing page templates and drag and drop system is fantastic, and integration with WordPress is simple. You also get an unlimited amount of landing pages and unlimited domains which is nice, but you can get the same at GetResponse for a lower price. The price is one thing that definitely throws me off when I thought about using their services. At the lowest plan and a monthly fee, I’d be paying $37 a month. The truth is, you only get the templates, the unlimited domains and pages, the ability to export HTML and integrate with WordPress. But you don’t get the Split Testing – which most all other services include for their base package. You don’t even get the option to add in opt-in forms to capture email leads – you have to pay another $30 a month to be able to access split testing, opt-in forms, importing your own templates, and to have 1st priority email support. That in itself kind of drives me away from LeadPages. Now I know I’m slamming LeadPages a lot, but I’ll say with what they do right (easy to use interface, and drag and drop templates with high conversion rates), they do it very well. 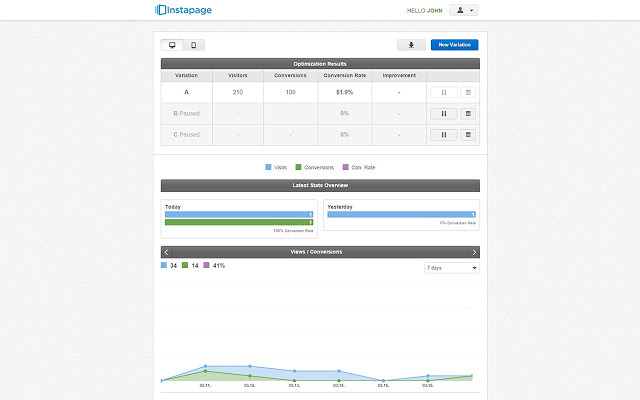 LeadPage’s templates are guaranteed to get good conversions if you plan and execute it right. So if you have the money and can put up with the fees, I’d say go for it. If you’re a new marketer with a tight budget, I wouldn’t recommend it. Pros: Advanced features like various funnels, email integration with all your favorite auto-responders, and built-in Split Testing. Cons: Can only have one domain but can have 20 pages for the starter page, if you want just one particular funnel you have to pay for the rest. ClickFunnels is an up and coming competitor to some of the very popular and well-known landing page services. I’ve noticed more and more people are turning to ClickFunnels for its ability to give you more than just a landing page. That’s because it gives you a funnel – this could be merely an opt-in funnel because you want to grow your list, or it could be a sales funnel where your potential lead is warmed up with a squeeze page, thrown into a sales page, and spit out into the order page. These funnels work surprisingly well and are surrounded by the praise of a lot of internet marketers. ClickFunnels took these funnels and did all the work and hassle of setting it up, so you just have to click and type a few times and have an automated funnel. That way you can focus better on your conversion rate optimization checklist and get automated reports. They took something already praised by the community, simplified it, and made it into a business. Unlike LeadPages, the monthly fee is worth it depending on what your needs are. If you just want a place to build you list, and then promote your own sales page after, the Personal plan is your best bet. If your a start-up business or someone who has the money to afford it, I’d highly recommend the Start Up plan. You get access to all of the funnels, and your number of domains gets bumped up to 3 and get a total of 100 pages for creation. Don’t let the price fool you. If you’re a committed marketer, buy this now. Pros: Free to use with no payment info required, and free hosting. Cons: Limited amount of themes and additional fee if you want more, limit on only 100 visitors for a free account. Instapage puts their money where their mouth is by letting users sign up for their service for FREE. No credit card info, nothing. You can sign up and get started in minutes, and if you’re on a budget, this is the perfect place to get started – you get a free 100 visitors and one free landing page. This allows you to test out their service and then if upgrade if you like. Now while it may be free, free doesn’t mean its the best. You don’t have to pay for it, but with the few templates you’re provided, you may want to. They’re not crazy expensive – but they’re not really “cheap” either, ranging from $18 to $21 a pop. Add that to the cost of their most popular plan, and with an $18 template you’re at $80/month. If you’re just marketing a personal project and do the basic plan, you’ll be fine. If you’re a business, I wouldn’t recommend doing the professional plan because you can find a much better deal with some of the other options in this post. Pros: No monthly fee Focused on creating quality landing pages, statistics built into pages so that you can track their stats. Cons: Steep learning curve, and a bit confusing for beginners. Landing Page Monkey does something very different from all the other options – there are no landing page templates. The main reason is because if everyone is using the same template, how are you supposed to stand out on the internet? 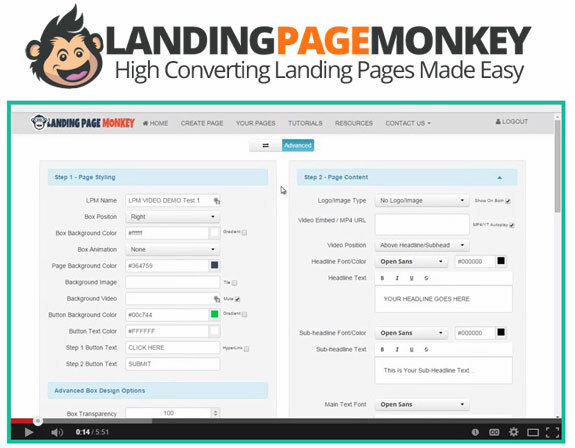 Landing Page Monkey allows you to create your landing page from the ground up with their software. They also provide tutorials and demos for those who need some help getting started. It’s a true one-time payment of $37, and you get unlimited domain names and pages all hosted by them and no additional fees – there is no “pro” version to upgrade to. It’s the flat out cost with no BS or up-sells. It’s perfect for the beginner or the expert marketer and a great tool if you want to stand out in a competitive space and start getting customers into your conversion funnel. Once you’ve made it over the learning curve, you’ll be getting potential leads in no time. Now that you’re educated on some of the most popular landing page options available, it’s your turn to take the next step and get your first landing page set up. In my opinion, ClickFunnels and Landing Page Monkey had the best to offer. For a businessI’d use ClickFunnels, and for anyone who wants to promote pretty much anything, I’d recommend Landing Page Monkey. : Want to optimize your conversion rate? Contact SEOnick now for a free SEO analysis! Thanks for reading my article, I want to give a shout out to Nick for having me on his blog, it means a lot. If you like what you read, I encourage you to checkout my newsletter.